IM 2013 in San Francisco brought a change in national leadership. Molly Cooke, MD, FACP, a professor of medicine at the University of California at San Francisco and a former Chair of the Board of Governors, assumed the role of President of the ACP. She will serve until IM 2014 in Orlando. Also assuming a national leadership role was Charles Cutler, MD, FACP, who became the Chair of the Board of Regents. Dr. Cutler, who will also serve until IM 2014, is a full time practicing internist in Norristown, Pennsylvania. Of note, Susan Hingle, MD, FACP, governor of the Southern Illinois chapter and a general internist and clerkship director at the SIU School of Medicine, will chair the Board of Governors in the coming year. Many of you may remember meeting Dr. Hingle, who led our leadership workshop at the 2013 MS/LA Regional Meeting in Point Clear. Additionally, Dan Woodliff, MD, FACP, started his term as Governor of the Mississippi Chapter. Dr. Woodliff, who practices general internal medicine at the University of Mississippi Medical Center (UMMC), will serve until IM 2017 in San Diego. Read his welcome message to the chapter. Among the Associates in the chapter, we also have two new leaders. Claire Brabec, MD, a rising third year resident in the internal medicine residency program at UMMC, has assumed the role of President of the Council of Associates & Students (CAS). Outgoing president Dominique Pepper will remain active within the chapter and will serve as one of three chief residents of the internal medicine residency in the coming year. John Saxon, MD, a rising second year cardiology fellow, will be this year's President of the Subspecialty Fellows' Council. He takes over this role from Carter Milner, MD, who will remain active within the chapter during her third year of hematology/oncology fellowship. Fellowship in the College is an honor bestowed upon those who have made contributions to the practice of medicine, to their community, or to the College over time. Each year at Convocation, those who have been nominated and then selected for Fellowship have the opportunity to be publicly recognized. 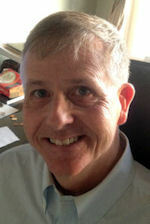 We'd like to congratulate Dr. John Reed, Jr. from Columbus on becoming a Fellow at IM 2013 in April in San Francisco. Learn more about requirements and application for Fellowship. 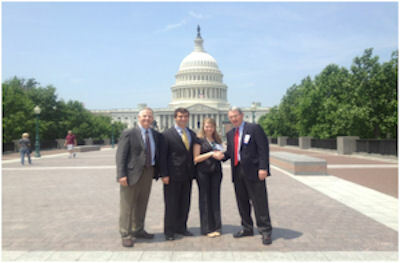 Lyssa Weatherly, Zeb Whatley, Bob Brahan, and Dan Woodliff attended Leadership Day in Washington, D.C. on May 21 and 22. The first day was an extensive review from a team of experts on issues,policies, and pending bills that affect internists and their patients. Our group chose to focus most of their efforts on improving graduate medical education funding and eliminating the sustainable growth rate and sequestration policies. They heard stimulating talks from a Democratic and Republican congressman, who both gave insider tips on what is effective when acting as an advocate. The second day our contingency visited our senators and congressmen and their staff. This was a fantastic learning experience, and the group's approach was to look for common ground and possible bipartisan solutions. In doing so, our four chapter representatives were concise and had a few key points that they made on each topic. Lyssa and Zeb, Dr. Woodliff reports, were great at this. They all agreed that trying to make a difference by participating in the advocacy process was worth the effort. For the past several years, the Associates and Students of the Mississippi Chapter have been very active with the Jackson Free Clinic, a student run clinic that provides care to those who don't have the means to pay for medical care at most clinics. The CAS frequently provides physician volunteers on the 2nd and 4th Saturdays of each month. Members of the chapter are also encouraged to volunteer at the clinic, which is typically open from noon to 4 PM every Saturday. If you are interested in volunteering at the clinic, go to the Web site. Each year the CAS, in conjunction with the Department of Medicine, holds UMMC ACP Abstract Day in the student union on campus in Jackson. This year's event will take place on Thursday, November 7th, and will begin with the poster competition that morning between approximately 9:30 and 11:30, to be followed by the oral presentations and an awards lunch upstairs in the same building. The last two years of this event have produced some fantastic case reports and research, much of which has been presented at the annual Internal Medicine meeting. Make plans to attend this year's event, which is sure to be every bit as exciting as in years past. Winners from ACP Abstract Day in 2012, as well as several at large entrants, represented the Mississippi Chapter at the ACP National Abstract Competition in San Francisco at IM 2013 in April. Among the presenters were Brett Bennett (3rd year resident), Alycia Cleinman (geriatrics fellow), Mandy Fowler (2nd year resident), Kamel Gharaibeh (2nd year resident), Arnaldo Lopez-Ruiz (2nd year resident), and Adesh Patel (3rd year resident). Also accepted was Dominique Pepper (3rd year resident). Please congratulate these residents and fellows when you see them, as this is a significant achievement for them as individuals and for the chapter. If you have any questions about the chapter or any feedback on our newsletter, please don't hesitate to contact Dr. Woodliff, Nancy Youngblood, or Calvin Thigpen.